Minterne Magna is a village on the A352 from Sherborne to Dorchester in Dorset. 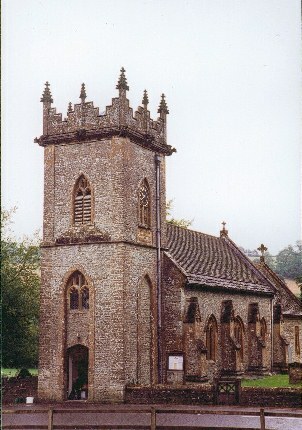 The Church of St Andrews is unusual with a door opening directly onto the main road. Inside and to the left is a little chapel in which there is a large marble memorial, out of all proportion to the church, taking up the whole of one wall, placed there by Sir Nathaniel Napier in the early 1700s giving loads of information about the family. There are other memorials in the little chapel to members of the Napier family and various family shields displayed around the wall just below the ceiling. There are a few 'Napier' grave stones in the churchyard and the register shows that a 'Napier' married in the church in the 1990s.